Endgame...Closing in on the perfect rebreather for me. 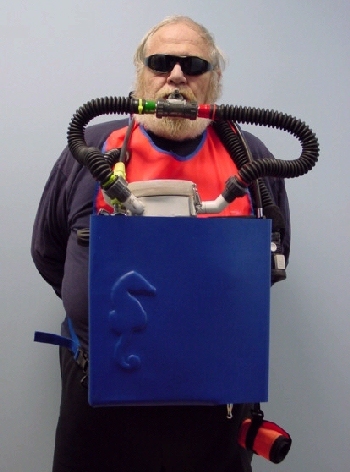 A Kiss type Closed Circuit Rebreather with dual oxygen sensors weighing ~26 pounds allowing about three hours in the water with depths to 140 feet. A history and breakdown of the system. Warning....If you have a deathwish, dive a rebreather...The graveyards are full of those who have died on rebreathers. Damned good open circuit divers have died, damned experienced divers have died, and more will die. 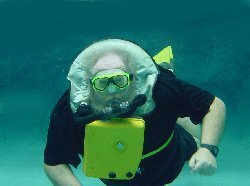 All rebreather dives are experiments and some experiments fail. These life support systems are really dangerous. I recommend that you get your rebreather pleasure from reading about the exploits of others and not by trying to copy what I have done. It just isn't safe. 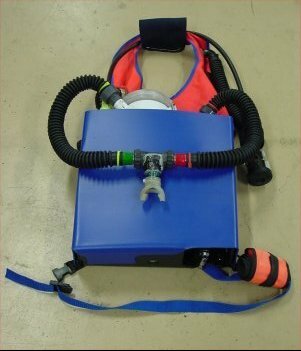 My first recent brush with a rebreather early in 2001 was a simple system. My operational plan was to develop a system that would meet my diving style as a reef inspector with video and still camera in hand. 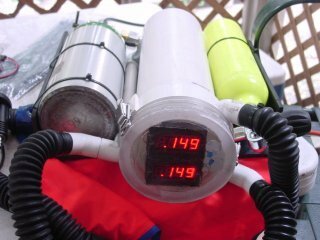 This meant diving to less than 100 feet of sea water (most of my diving is in less than 40 feet these days) with the quiet of a bubble free underwater life support system. 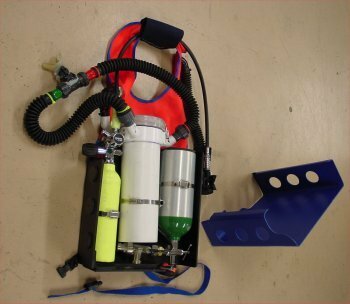 Other goals of the project were longer dives, less decompression obligation, and a lighter weight dive apparatus. My current interest is not in a computer controlled system although that is easily within my reach. I am content to use a constant flow (.9 liter per minute) of oxygen, dual displays of PPO, and manual addition of oxygen or air for the necessary Nitrogen at depths below 20 feet. Another design goal was to minimize the need for tools for assembly, disassembly, and service. I knew I would have to crawl before I walked so I took my time and explored a lot of options. These experiments and projects can be found on my rebreather pages. Along the way, I got encouragement, help, and a lot of kidding from a number of persons, generated a patent pending with Dr. Bob of the world famous CEDU. Got the excuse to do a lot of extra diving, played in the shop, stretched the mind muscles and made a lot of rebreathers and new friends. A great year and a half. I am pretty sure that I now at endgame. Is is perfect....heck no. Does it dive well...it certainly does. Did I meet my all my goals...yes I think I did and had a lot of fun along the way. As I look at the 26 pound package with a 3+ hour dive time at proven depths of 85 feet by me (and 140 feet by Ken Swain), it is pretty simple...I almost ask myself, "Why did it take so long?" I know the answer...ideas start out simply...get complicated...and as you progress in your knowlege...can get simple again. In my case the destination was only part of the prize, the journey was the bigger part. How much did it cost? My best estimate of parts I purchased goes to around 3,000 dollars and hundreds of hours. If I had gone directly to the final configuration the costs would have been less than $800. I now have the parts to build two more of these systems...one for my daughter and one for my son and still have a number of replacement parts for the future. Considering the fun I had, that is a good deal. I started this with a East German military surplus RGU pure oxygen rebreather. I purchased the first one off Ebay from Harbour Supply...eventually I bought 5 of them for parts. I ran to the pool to do my first tests. Learned about leaks a lot that day... My first modification was to paint the cover reducing that military look. I made a lot improvements to the RGU as it was manufactured by changing the mouthpiece, making the scrubbers refillable, and changing the counterlung. 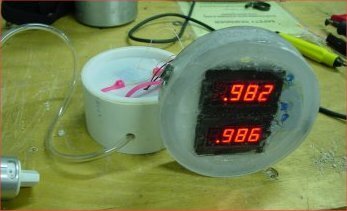 My next major step was to add an Air 2 regulator and pony bottle for dilution and bailout and the necessary PPO sensors and displays. 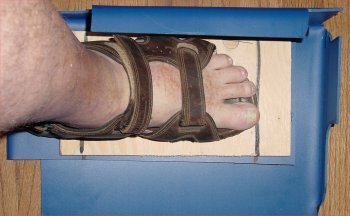 After many pool and quarry tests I took that configuration to Roatan in January of 2002. It was a great success. In the spring I moved the pony bottle from the bottom to the side, increased the hose length, and made a few other minor modifications. In July I dove with Dr. Bob in La Jolla California the weekend prior to Bobs and my trip to Roatan where I used it a lot while he tested some improvements of his FEOR. I was ready for the full upgrade. The physical layout of the system was fine except for the display. 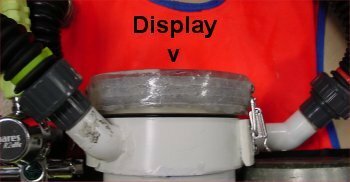 I wanted the display to be mounted on the scrubber and reduce leak potential as well as dangling stuff. Construction started in late August with each new element tested in the pool and the quarry. By mid September I had a configuration that met all my needs. 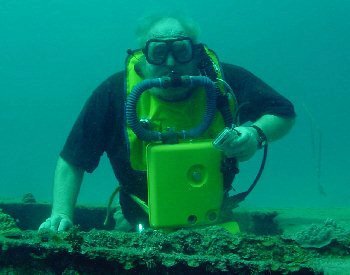 Bill Weatherford (a diving buddy of some 42 years) and I tested it in the quarry while he tried out his newly purchased RGU just out of the box. It was now time to "make it pretty" If you have made it through all of this, here are the details of the system and some information on the materials I used. Here is the system laid out. You rebreather experts will understand the whole system at first glance. Most of the ideas implemented here are old hat and some are over 100 years old. The system consists of a single counterlung, axial scrubber, double hoses with one way valves and shutoff in the mouthpiece, continuous flow oxygen regulator on a tank and a dilution system that doubles as a bailout bottle. Lastly there is a dual display of the PPO for diving below 20 feet. Assembled it looks like this. Kinda like getting those clowns back in the car at the circus. There is not a lot of wasted space. The RGU tank has been replaced with a 245 liter oxygen tank adapted to the RGU constant flow regulator. I built a new scrubber for 3.5 pounds of sorb. The pony bottle is now enclosed in the case. Lastly you can see the side of the display at the top of the scrubber. One of my guys welded draw latches to stainless steel bands to help me hold the tanks and scrubber in place. It is a damned good thing that I got Allan to do it because I can't make simple iron welds, much less thin stainless steel. The cover is on the right. 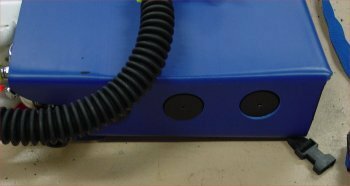 The case is 1/4 inch black PVC and the cover is 1/8 inch blue polyethylene. Both are thermoplastic materials. Each started as flat stock and were heated with a heat gun and bent into place to fit. Note the holes in the cover. They match up with disks on the side of the case to hold the cover in place. I used a cheap 2 inch hole saw to drill the cover. This is because cheap hole saws have thin walls. Then I used the same hole saw to cuts disks out of scrap case material. I sanded undercuts on the disks to help hold the cover on when it would be in place. After putting the cover on in the exact place I wanted it, I glued the disks to the case through the cover holes with PVC cement. It came together quite nicely. Starting the loop tour at the mouthpiece. The mouthpiece is one of the only RGU parts left but it is modified in that a shutoff has been installed. The RGU hoses have been replaced by new US Divers replacement hoses to reduce Work of Breathing (WOB). Red on port side (exhausted air) and green on starboard side (inhaled air). To make the hoses fit, I put PVC unions into a lathe and made hose barbs. Then I heated the other end and slid them on the RGU hose fittings. Exhausted air goes down the hose to the scrubber. The scrubber is made of 4 inch PVC. Sorb Screens are modified snap drains from Home Depo backed up by air condition vent filters. The top seal of the scrubber is the dual display. It is held on by stainless steel draw snaps and has an "o" ring seal. Screw on fittings attach the hose to the scrubber port (another fine product from Lowes). The exhaust air (red marked hose) enters an external tube to the bottom of the scrubber. There is a water trap in the bottom of the scrubber. The air flows up the scrubber and out a port through a short hose into the counterlung. Another of the few parts of the original RGU that are left. These include the counterlung port and the hose. I just cut a hole in the snorkel vest and added the port from the RGU. If you look closely you can see how the "o" ring fits on the scrubber. 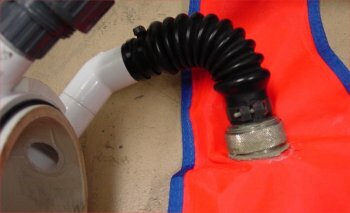 The "O" ring support ring is a cut off PVC pipe cap that has been reversed and glued in place. 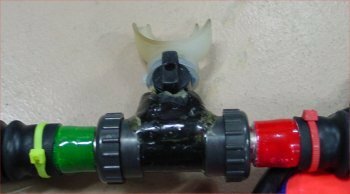 Air from the scrubber goes back to the mouthpiece from the counterlung through the green (starboard) marked hose. Again you can see the front view of the display, the side snaps, and the "o" ring. The oxygen sensors are in the top of the scrubber and the electronics are in the clear portion. 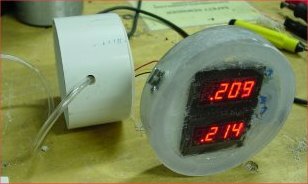 The clear portion was made by gluing several Plexiglass rings together and gluing a piece of Plexiglass on the top. Displays are glued to the Plexiglass on the top to prevent condensation from making them hard to read. There is a pot to adjust each of the two displays to make the sensors agree with a known PPO. I cut off a short section of 4 inch PVC to make a calibration device for the sensors/display module. The sensor support fits in the PVC pipe and the display can be adjusted. Oxygen is introduced from a regulator flowing at 1 liter a minute into the calibrator when it is flat on the table. This allows the span adjust. The low validation point is the ambient air PPO. I just turn off the oxygen flow and tip the holder up to expose the sensors to ambient air. I note where the display reads. The last digit is not important. Because the slope of the two sensor/displays is not going to be exact, I am not concerned that they are a little off. There is uncertainty in any measurement process. I have no intention of going anywhere near as low as .21 PPO when I am diving. Guess the next to last digit is not really important. Below .6 and I bailout. A second display sensor head was made with LCD displays. I still have not decided which one I like. My buddies love the led display if I am behind them because they can see me in the murk. In dark water, it is best. However, a new battery is needed every two hours. Maybe a second battery in the housing....The LCD displays last all week. Just before a dive I now give the sensors a little exhausted breath test to check that they go below the .20 PPO. With no oxygen flowing I breath the system to watch the sensors flow down...checking how closely they track. This is the divers eye view of the displays. Snapping the cover on and here is how it all hangs together. A few things to note. 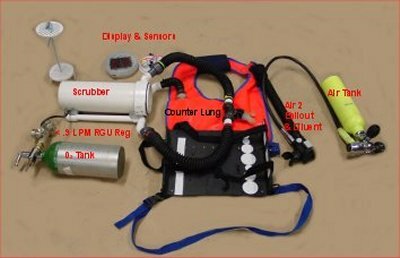 The hose from the air bottle goes up and around the vest and attaches to an Scubapro Air 2 regulator. This allow introduction of air to the counter lung bringing up the nitrogen level below 20 feet. It also acts as the bailout regulator. 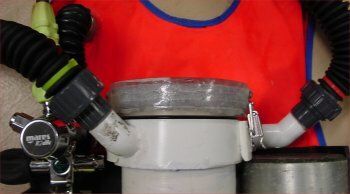 There is a pressure gauge on the bailout bottle first stage for pre dive checks. The Air 2 regulator does not dangle, it is held in place by a rubber mouthpiece holder. Completing the rig is a matching blue waist strap, a pad for the neck of the vest and some "D" rings to attach things like cameras, signaling devices, etc.. when diving. As the cover is polyethylene, it can be distorted to a desireable shape by heat and pressure. Thats how lots of toys and decorative things are made. I drew a simple outline of a seahorse and cut it out. That was going to be the male plug part of my mold. I drew the outline on the covermaterial. Using a scroll saw I cut it out. Then I drew the outline of the male plug on another piece, made the outline wider, and cut it out to make the female cavity. 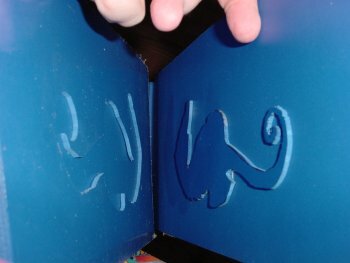 Using the seahorse and the hole from the other seahorse, I made a press mold by carefully positioning the two pieces together and gluing them in a sandwich. Then I added a piece of 5/8 in plywood to the pressmold so I could stand on it to provide the necessary pressure. Now I had the necessary ingredients, heat and pressure. I tried the press mold on a piece of scrap from the cover. I softened it with my heat gun and pressed it between the two patterns in the vise. It worked perfectly the first time. I carefully heated the area of the cover that was going to be molded until it was like soft rubber, quickly placed the cover between the parts of the sandwich, placed one of my size 10 1/2 EEEE feet on it with my full weight, and stood on one foot like a stork. Was it going to work or would I now spend more hours making a new cover after I screwed up? I stood nervously for a few minutes for the cover to cool in the mold. 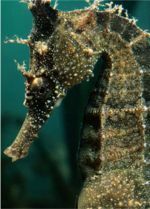 I took the cover out and there was my seahorse. It worked....and here is the fully assembled system in its present state. Goals met. Light weight...Long dive potential...Compact design...Nothing dangling...Kiss operation...and the only tools needed are a tiny screwdriver to adjust the pot on the display and a wirewrap tool about the same size to change sensors. Everything else hand tightens or snaps together. After writing this I got a number of responses asking for a better description of the rebreather operation. I enjoyed seeing a bunch of rebreather guys at DEMA where I showed off the system at one of the two rebreather parties. No comment on some of the comments....Gordon just shook his head and sighed. Guess he figured I was the next casualty in the body count. I want to thank Tom Rose for his contribution to this section!